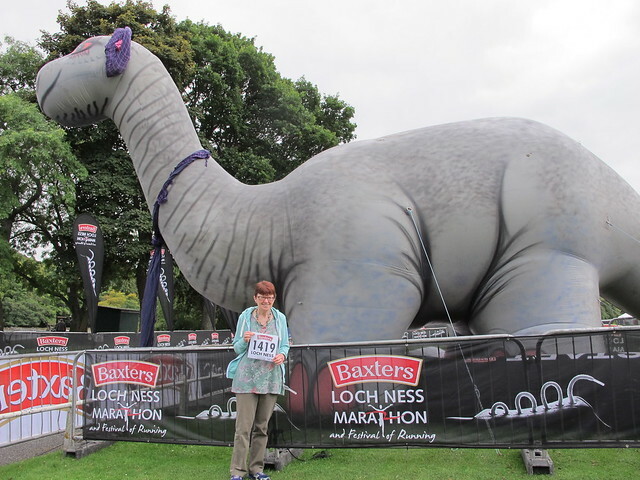 The Baxter’s Loch Ness Marathon is held practically on my doorstep, so it would be rude to do others and not this! I ran it in 2014 on the back of 5 weeks off running with an injury, but with a nod to go ahead from my sports physio, and completed in a poor time. I was determined to try again this year and aim for a better run. Craig entered this race too, with the aim of going for a PB. This year the training had progressed well and I’d managed two marathons prior to this. So it was with high expectations that I prepared for this. I wasn’t disappointed. This marathon was an amazing experience, and my favourite marathon yet. It is a linear race and the day starts with an early departure from Inverness on a fleet of buses which head south along Loch Ness. On reaching the southern point of the loch at Fort Augustus, the buses head north on the minor single-track road running along the southern shores of the loch. 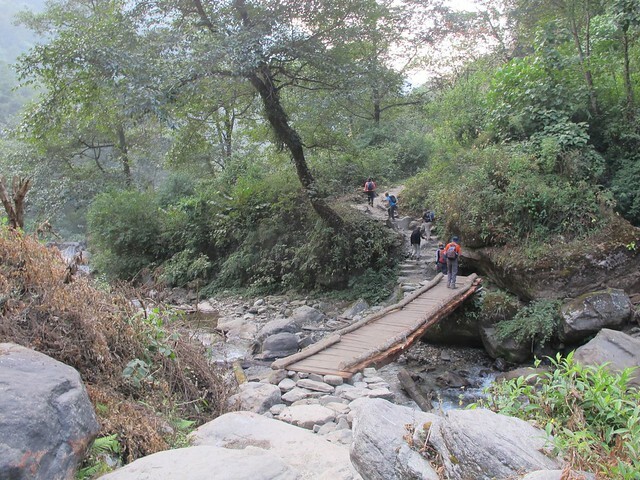 This was to be our route. There was an excited buzz on the hour-long bus journey, and I was able to enjoy looking at the loch from the north side, a little more than last year, when I felt sick with the excitement and dread of what was to come! The buses dropped us off ‘in the middle of nowhere’ in a beautiful (but sort of bleak) purple heather-clad moorland high in the hills above the loch. 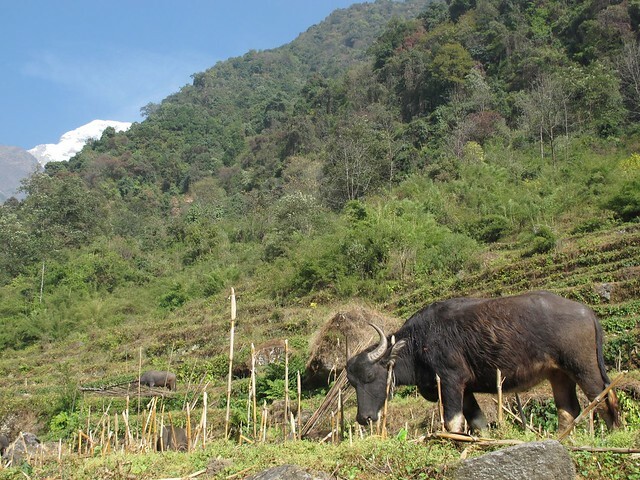 It’s actually at 300m above sea level and had been really cold here last year, but was merely a little chilly this time. It was a bit surreal to see over 2700 people milling around the single-track road and sitting or standing on the hillside in what is usually an empty location. Very many of these people were in queues – either for the portaloos or the tea/coffee, but the marshals were organising the movement of people very well and the queues weren’t TOO slow. I hunkered myself down in the heather for a wee while, sitting on my plastic bag. 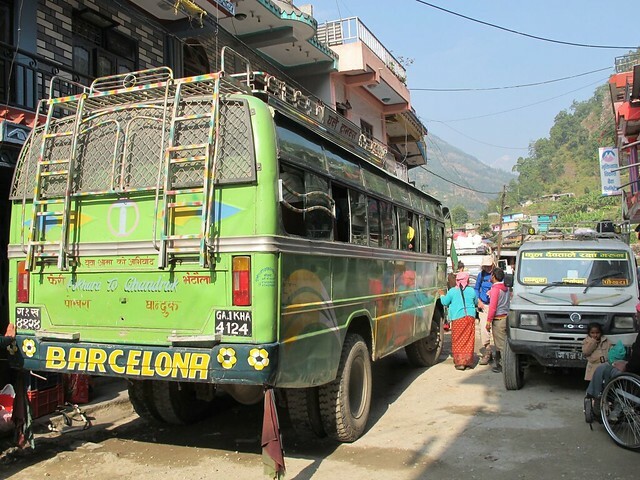 About 30 minutes before the race start, I braved the chill in the air and removed my sweatshirt and trousers so I could deposit my rucksack in the baggage lorries which were due to depart at 9:40. 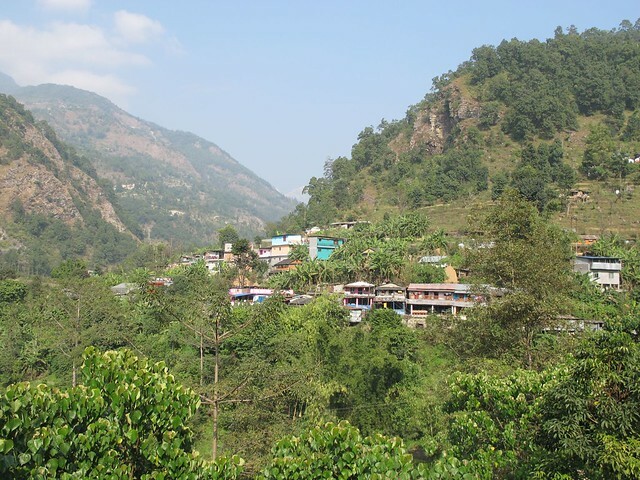 As I made my way along the road towards the start line I admired the wonderful view ahead; the road sloping gently downhill, with the hills all around and I was really excited about the race. I took up position a wee ways behind the 4:30 start sign, but shortly all the runners were told to make our way forwards as the field was looking a bit bare at the front. I shuffled forward a bit, but I don’t know how many others did as ended up next to a guy who was aiming for a sub-4 hour time! At the gun we were piped across the start line by a local school pipe band and I was on my way. 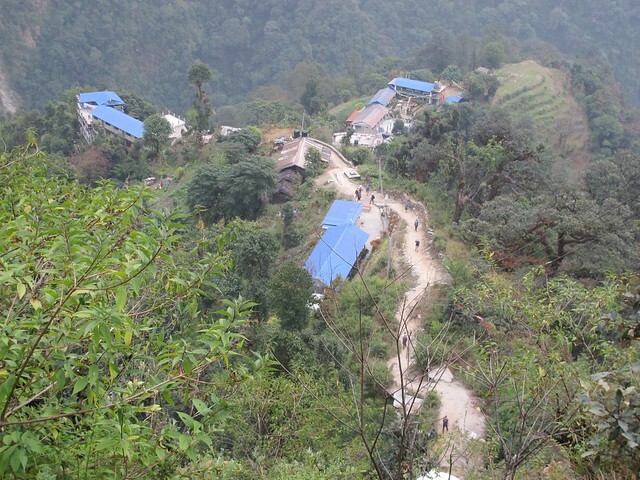 The first 15km are downhill with a couple of minor uphill sections. I set off too fast, but was passed by very many others, but the crowd soon dispersed and there was ample room for passing without too much weaving round others. The first drinks station came up at 3 miles/5 km and although I don’t usually drink so early in a race, and I was in a good, easy rhythm, I’d decided I was going to take water at each drinks station this time and stay fully hydrated. I swiped one wee bottle as I passed and drank a few mouthfuls as I ran. I walked through all the other drinks stations after this and drank the whole 330ml of water. Neil appeared at Foyers road junction and got our photos. I hadn’t expected him so soon on the route and when I glanced at my Garmin I was surprised to see I done 10km and had run this in 60 minutes. 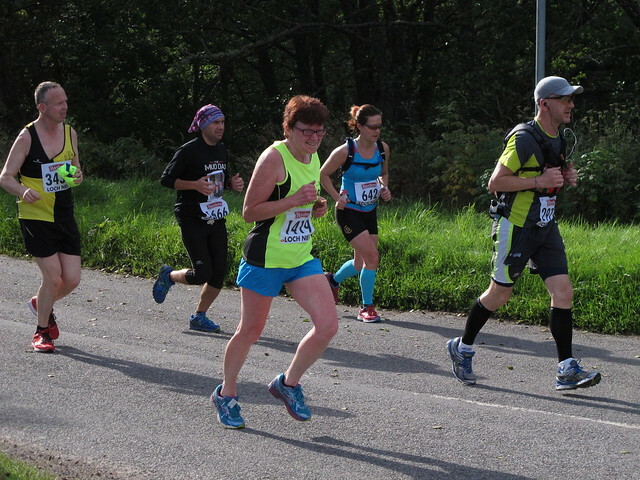 I wasn’t worried at going too fast, as I knew most of this had been gravity assisted and I felt I was running with a steady pace and felt really good. I didn’t check my Garmin for most of the race and purely ran on feel. Neil’s photo show one of the smaller uphill sections and shows the leading three passing here (about 10K) in 33 minutes! I found I didn’t chat to as many people early in the race as I had in other marathons. I wasn’t deliberately ignoring them, but I think the runners were just changing positions more than in other races. 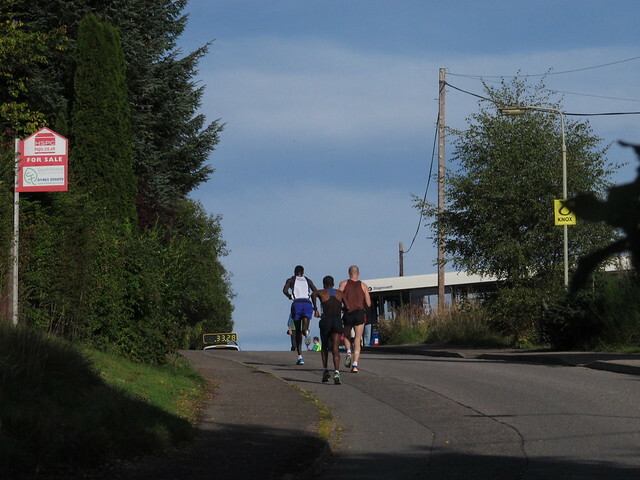 I passed a few folks who were walking up the first small hills, while I felt strong and in my rhythm and was able to keep going. I did get very hot however, even though the sunshine was initially quite weak and was glad for the bits of tree cover. I saw Neil again at the road junction about 15km along, at Inverfarigaig. And strangely, a tall guy with a distinctive mustache who had been standing beside him at Foyers – and who reappeared at several other places on the route!, and a small crowd of spectators. Out here in the countryside, anything other about 10 is a crowd! We now had a long stretch of road with very few spectators, but those few who did appear were very enthusiastic, including one guy blasting music from his jeep parked at the end of a driveway into the forest, one family handing out jelly babies and another guy playing the bagpipes stood outside a wee cottage. 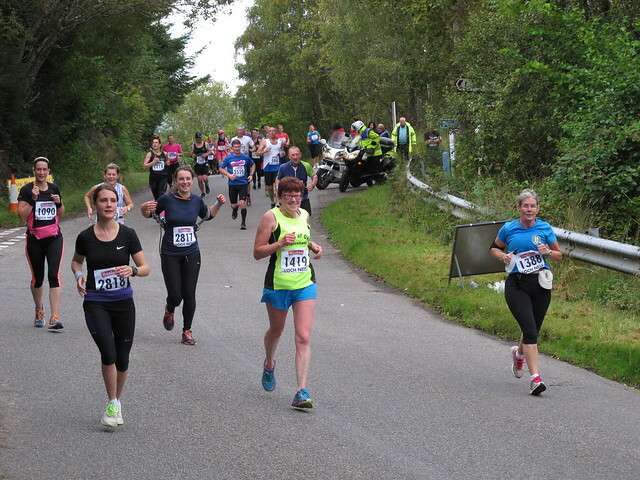 Also, maybe to make up for the lack of spectators, race organisers had ‘helpful’ signs along the route, stating “A wee bit hilly” before the smaller hills earlier on and “Slightly steeper bit approaching” before a ‘proper’ hill! I checked my Garmin again at another drinks station and was pleased to see a HM time of 2:10. 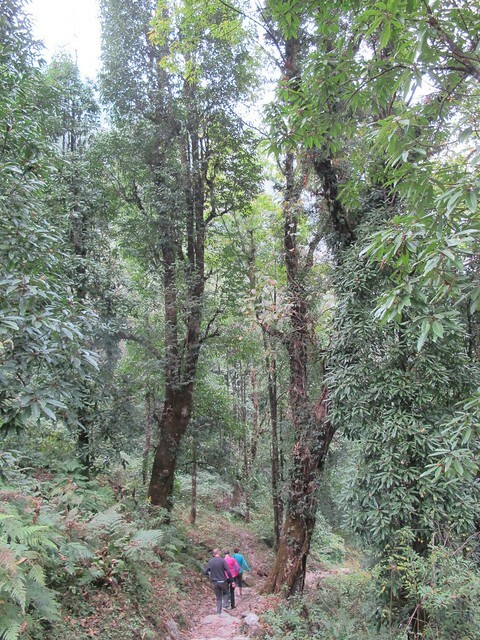 As well as enjoying the scenery on the section of the run, I wrote long passages of witty prose for this blog in my head – which I promptly forget during the final struggle to the line and the post-marathon physical and mental crash! As well as taking on water and hydration drinks at each station I was able to stomach a few Cliff Shot Bloks which I think really helped. This is not to say I didn’t suffer with GI distress at all, as I ran for about an hour thinking “I’m going to have to dive into the bushes any minute now!” during a loooong stretch with no portaloos. I finally found a loo at Dores and lost a few minutes on a pit stop! We headed north-east from Elgin along a minor road I remembered from running the 10K race there a few months ago. 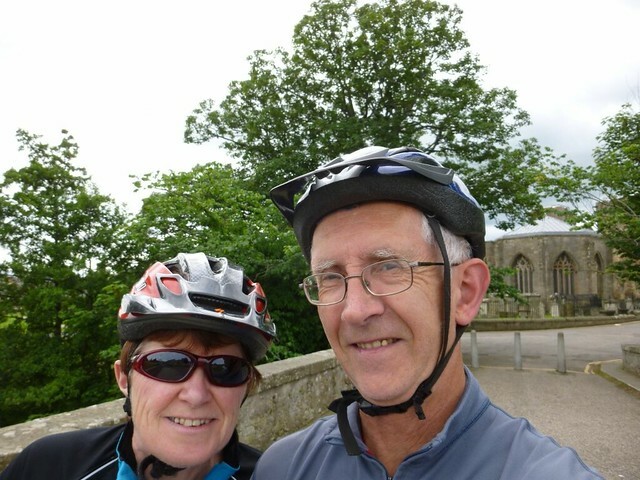 We followed the road to Arthur’s Bridge at the edge of Lossie Woods – Grid ref NJ 256670. 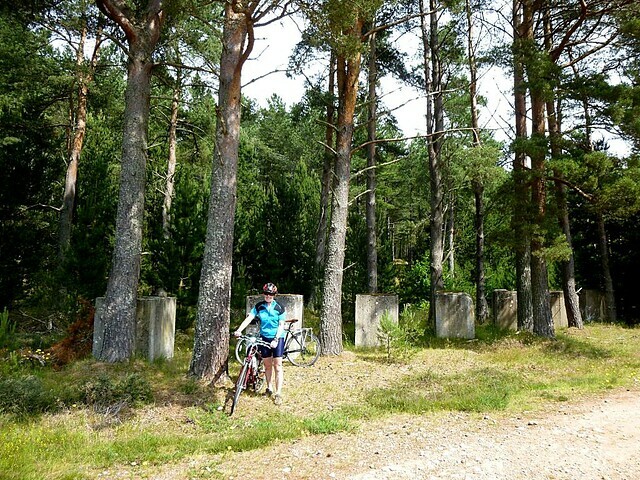 Our aim was to look for the tank traps in the woods and by following the main track north towards the sea we soon found these large structures. 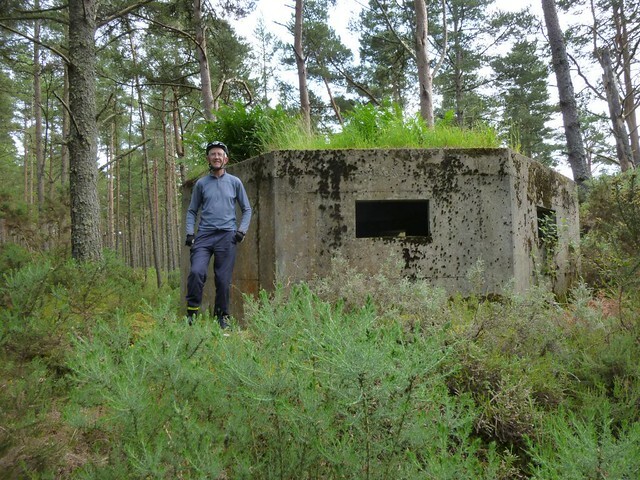 We’ve come across WW2 relics in the countryside before, and especially along the Moray coast, but these are very unusual in that they are intact and completely surrounded by trees. The man responsible for the Coastal defences in the north east of Scotland during World War 2 was Chief Royal Engineer G.A.Mitchel. (1896-1964). It had been noted that during 1938, that the Graf Zepplin photographed the northeast Scottish coast in great detail in preparation for a possible future invasion. Other German aircraft had also been seen photographing the coast around north east Scotland. Mitchell thought it highly likely that this area would be an ideal site for a beach landing invasion force by the German army, due to its sandy beaches and good communications. 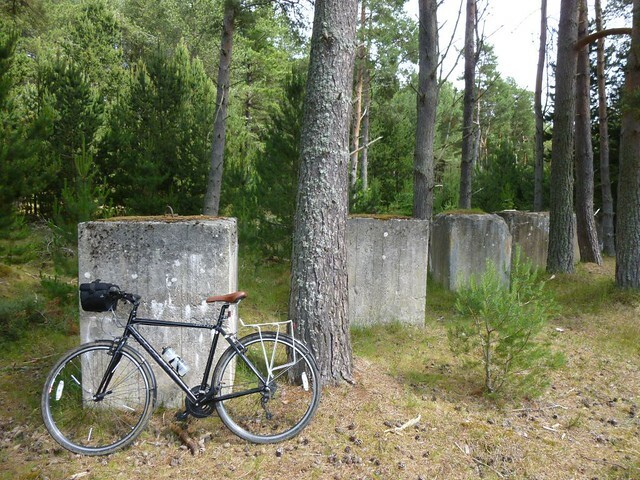 Elsewhere these large concrete structures were removed and indeed following the war, they was a bounty paid for farmers to remove these from prime cultivation land. But these here are among the sand dunes which subsequently were planted with pines by the Forestry Commission. As well as the line of anti-tank traps are hexangular pill boexs. This one of which was in great condition. The concrete was intact. Returning through the forest we followed the Innes Canal. This short canal, like the nearby Spynie Canal, was constructed to drain the low-lying farmland between Lossiemouth and Speymouth. It as engineered in 1812 by Thomas Telford at the request of local landowners. 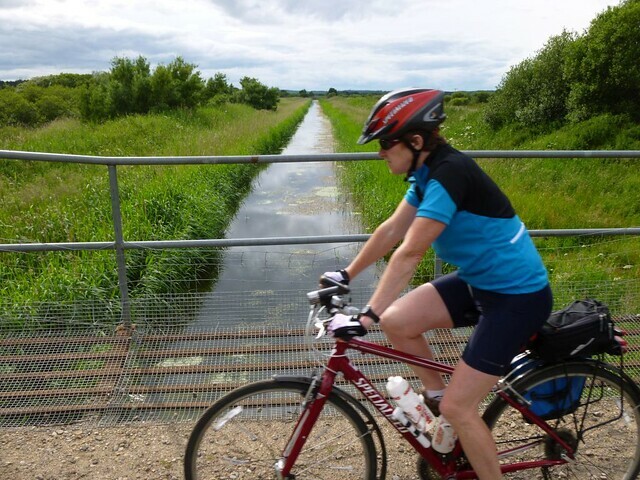 We were dismayed to see the canal side completely dominated by giant hogweed. Giant hogweed (Heracleum mantegazzianum) was introduced into the UK in the 1800’s as an ornamental garden plant. However it has now become naturalised in many river catchments across Scotland. 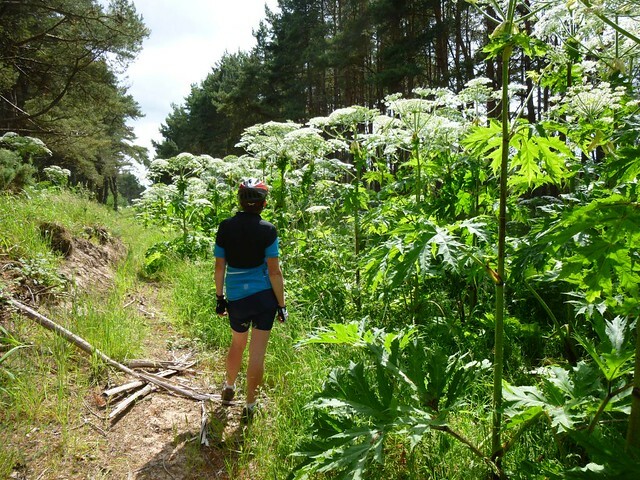 As with most invasive species Giant hogweed is capable of out-competing and dominating native plant species to the detriment of native biodiversity. Giant hogweed also presents a serious threat to human health as contact with its sap can result in blistering of the skin. 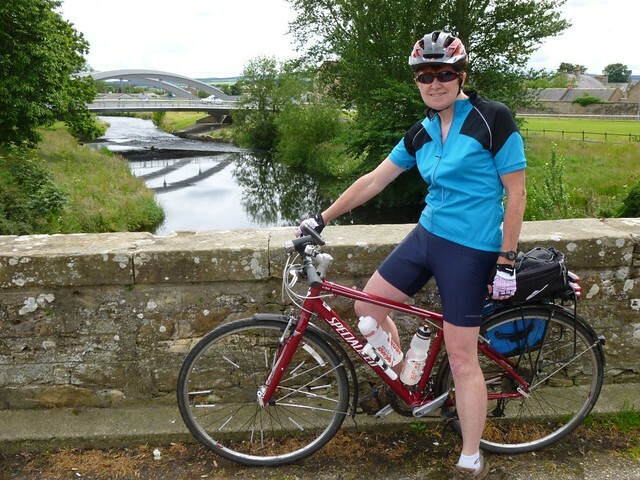 We have come across it before on both the River Lossie and Findhorn. 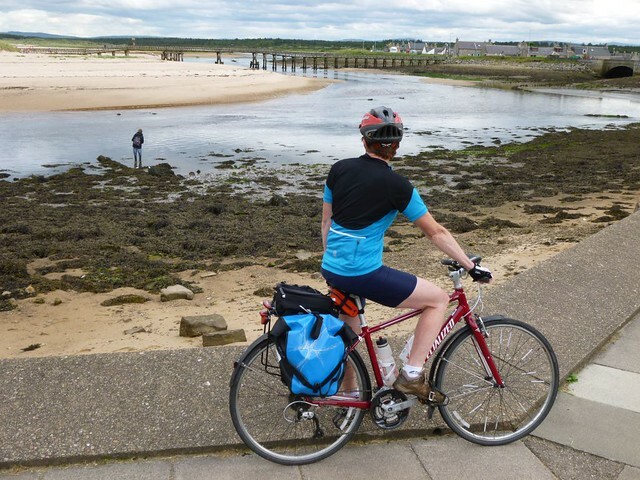 After returning to Arthur’s Bridge, we followed the road to Lossiemouth arriving as a food festival was almost finishing. 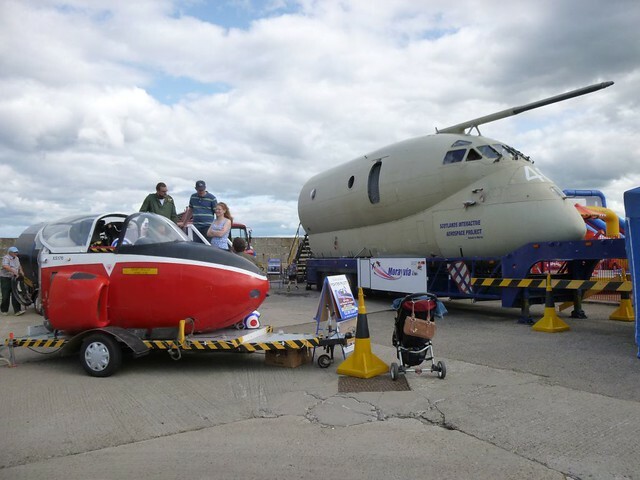 Neil managed to get a few photos of the old plane cockpits and we bought an ice cream. On the festival site were the remains of the old railway platforms at Lossiemouth. 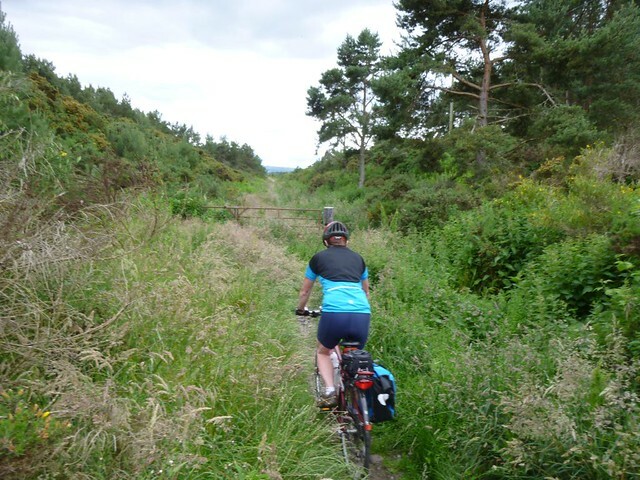 We returned to Elgin by following the old railway line. This route is not signed at all, and although it started off a little overgrown it soon opened into a wide dry, stoney farm track. An easy, albeit, bumpy cycle back. 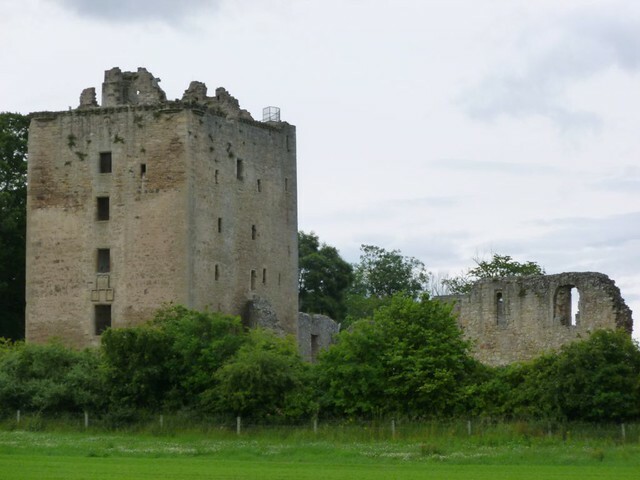 We passed the ruins of Spynie Palace which was for five centuries the residence of the bishops of Moray. 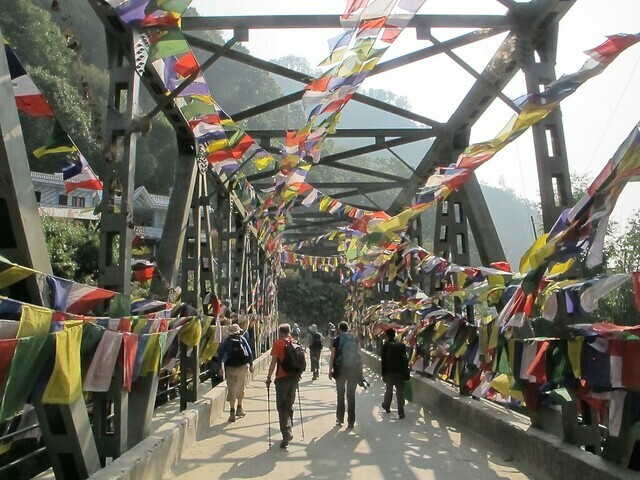 The Annapurna Sanctuary is high glacial basin lying forty kilometers directly north of Pokhara, Nepal’s second city. 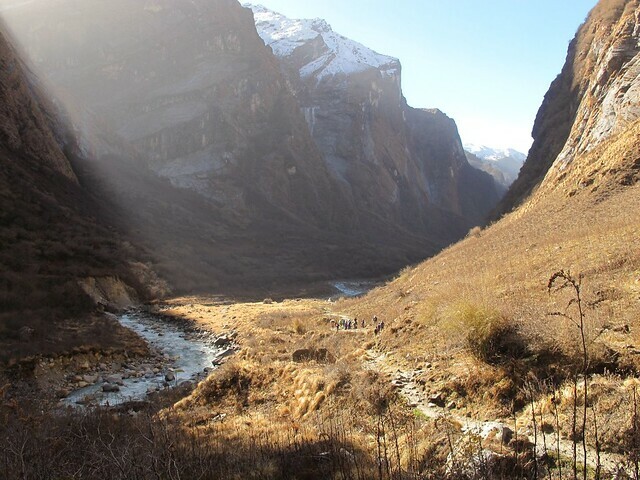 The Sanctuary is a huge amphitheatre ringed by glistening peaks and is said to be the home of the ‘Gods’. 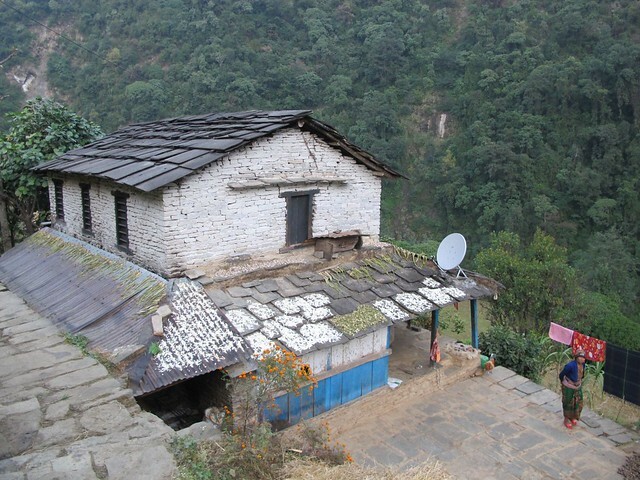 The entire sanctuary was held as sacred to the Gurung people, the only people to inhabit it before the 20th century. 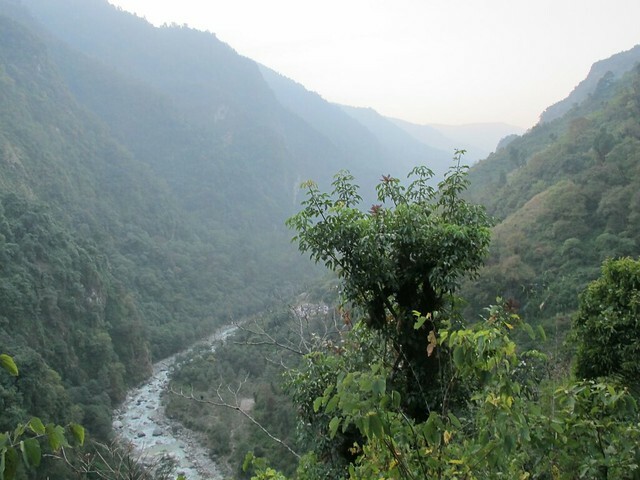 They believed it was the repository of gold and various treasures left by the Nagas, the serpent-gods known in India. The sanctuary was believed to be the home of several deities, from Hinduism and Buddhism as well the older animistic gods. 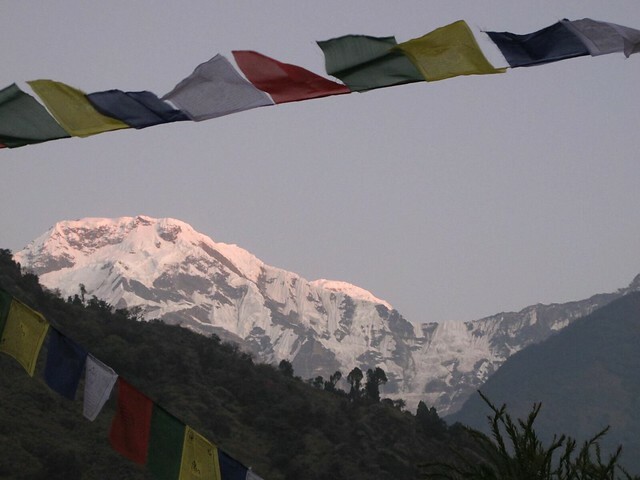 The peak of Machapuchare at the entrance was believed to be the home of the god Shiva, and the daily plumes of snow were thought the smoke of his divine incense. 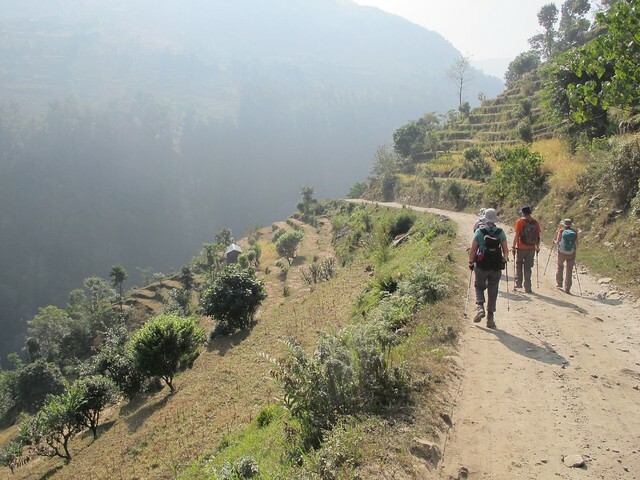 This oval-shaped plateau sits at an altitude of over 4000 meters, and is surrounded by a ring of mountains, the Annapurna range, most of which are over 7000 meters. 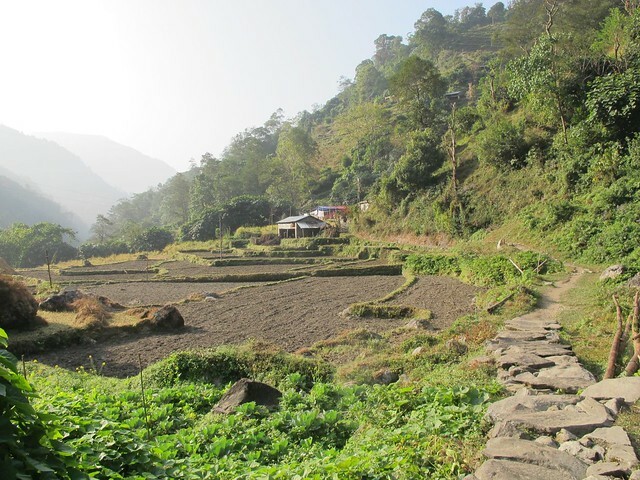 To reach the Sanctuary we trekked along two river valleys, going through remote villages and passing farms with tiny terraced fields, followed by walking up through forested hillsides. 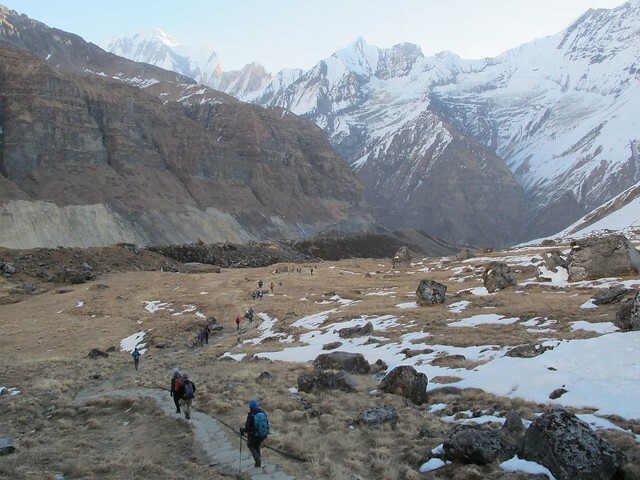 Finally we passed a narrowing of the valley and reached the world of rock, ice and snow that is the Annapurna Sanctuary. 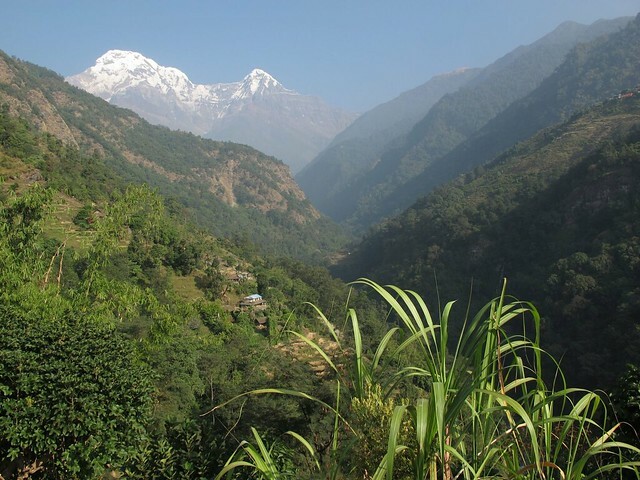 Here giant peaks such as Annapurna 1, Annapurna South, Gangapurna and Machhapuchhre encircle the natural amphitheatre. 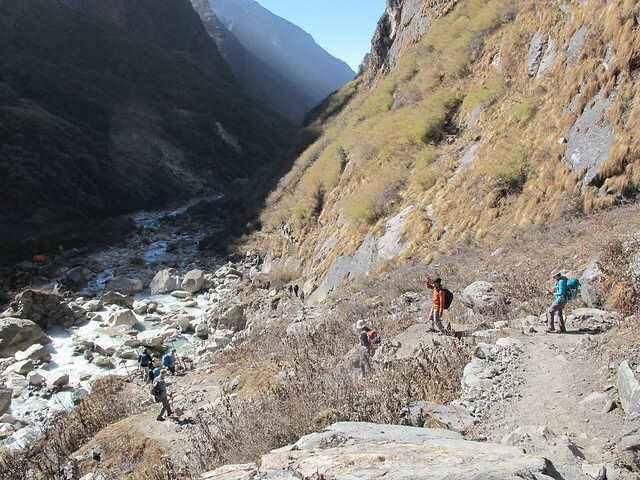 Descent was by a more direct route along the river valleys. The links below take you directly to the post for each day. 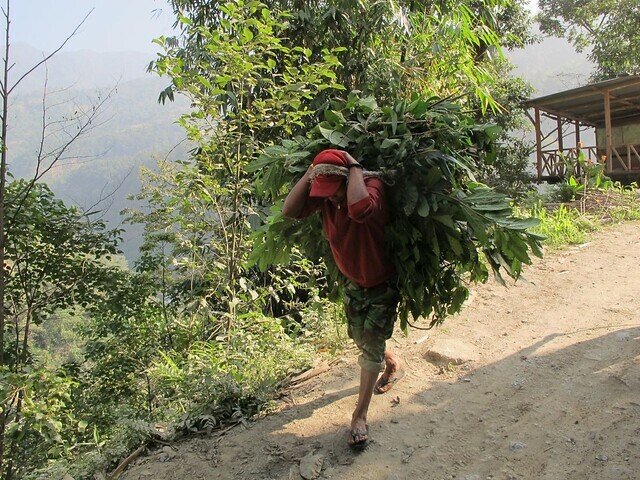 For our last day on the trek we had another early start as this was a long day. We didn’t mind getting up just after sunrise as again we had another wonderful view of the big mountains, in this case, Hiunchuli, from our tea house. 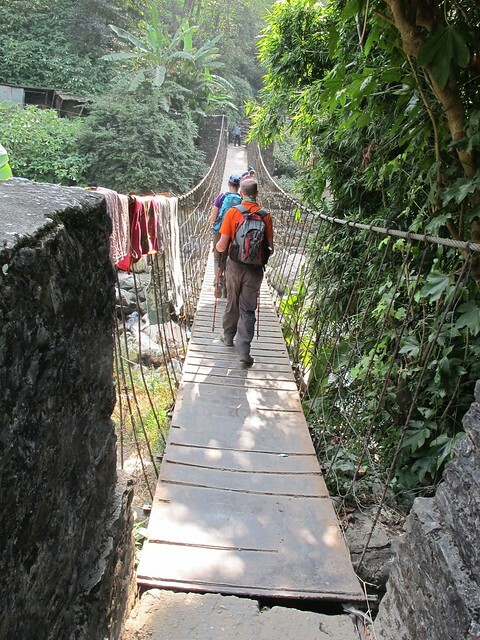 We had lots of descent today as we dropped down to the Modi Khola valley which we followed all the way back to New Bridge, about 400m lower than Jhinu Danda. 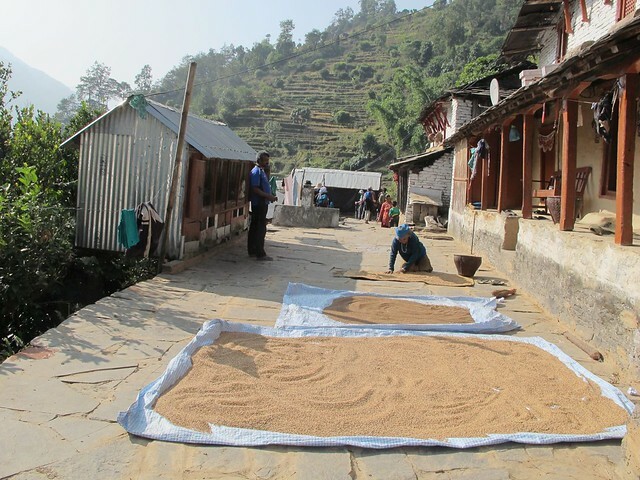 Like yesterday, again we passed many farms with newly-harvested crops drying outside. 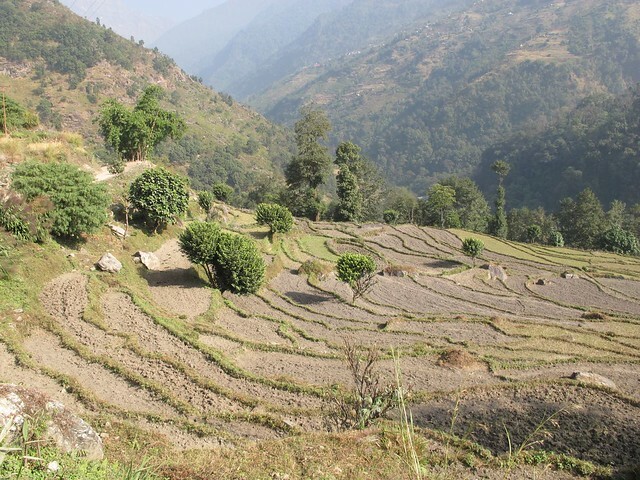 Gradually, as we descended, the valley widened out and the fields became larger. 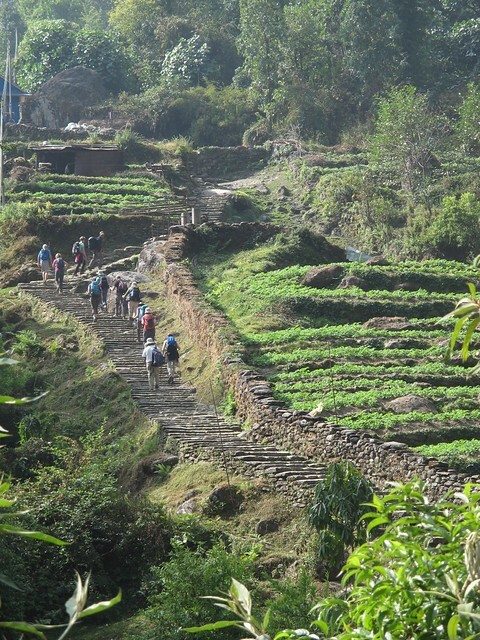 Much wider than the 1-2 metre narrow terraces we had seen for the previous week. 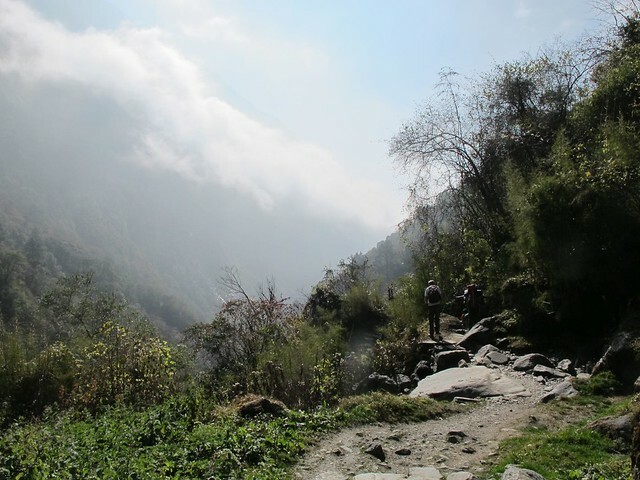 After several hours walk, and the usual morning tea house break, we left the Modi Khola and climbed up the valley side, and contoured along towards Ghandruk. 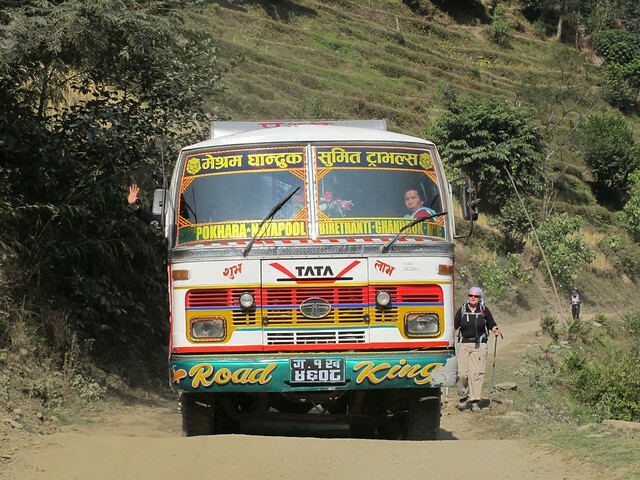 At Ghandruk we met ‘civilisation’ again in the form of a dirt road. 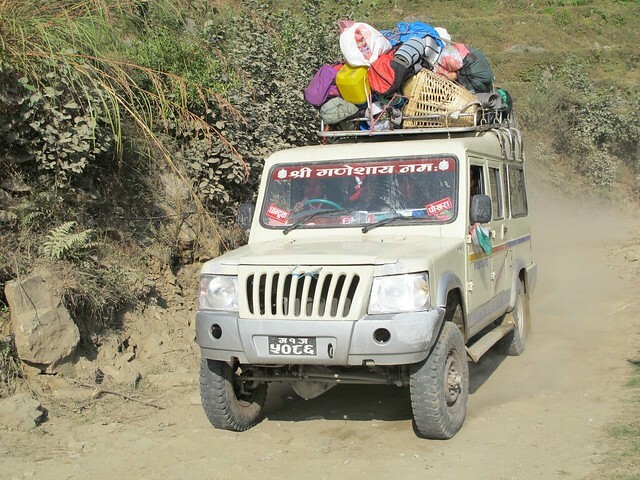 Some of our group choose to take a jeep ride from here back to Birethanti. The dirt road is a new development here and will, I imagine, one day become so busy that it will not be safe to walk out from here. 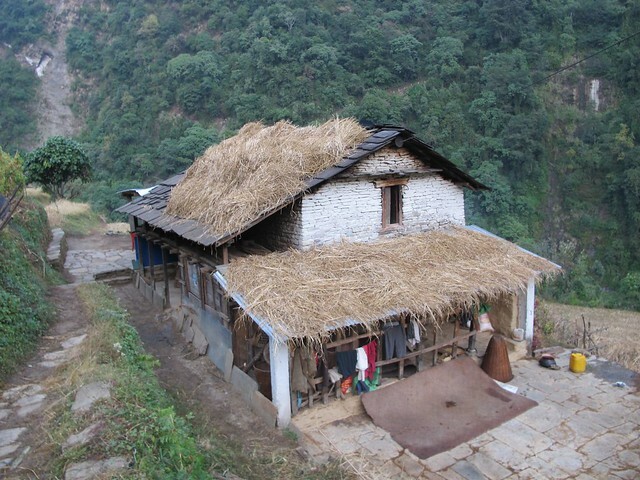 It is used by some of the locals too. 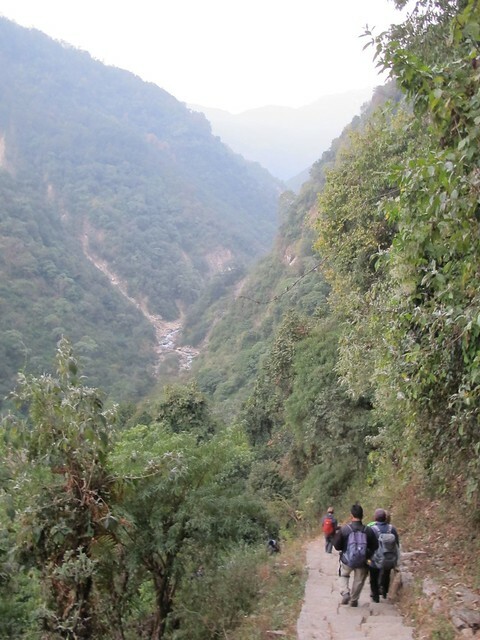 We were happy to continue walking along this original trekking route and were only bothered by the occasional jeep or bus. Most of the traffic was still on foot. 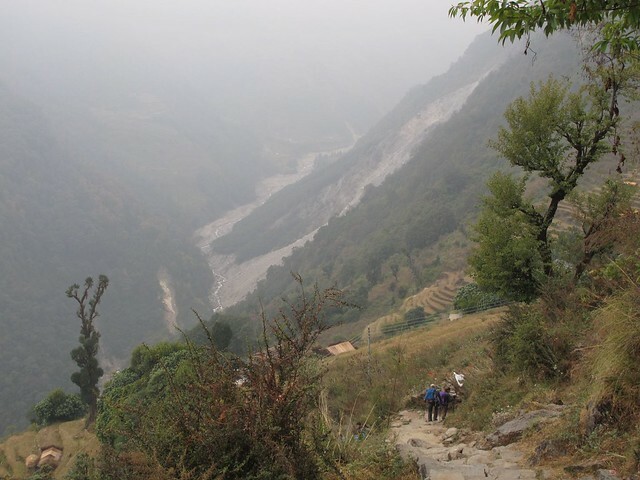 Soon we arrived back at Birethanti – where we has set off trekking from 10 days ago. 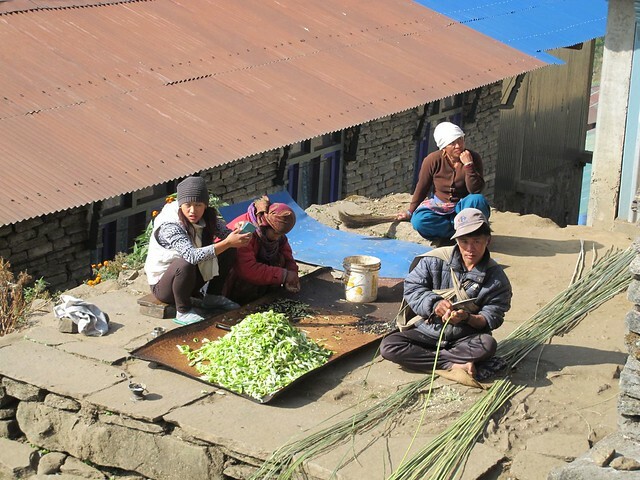 I high-fived my new friend, Saurab, one of our porters and had a very welcome long cold drink with my lunch in the restaurant. 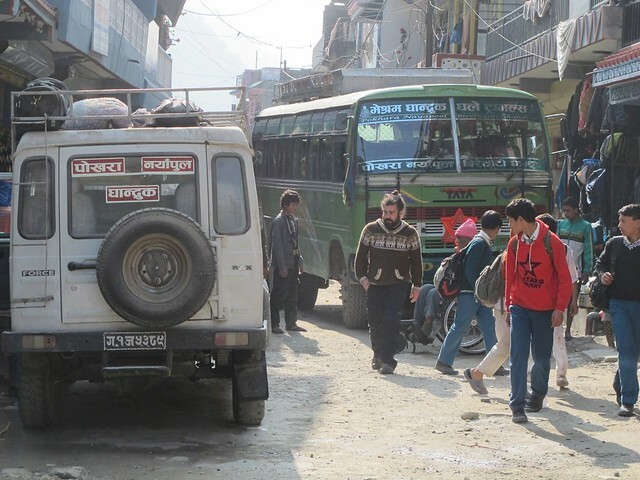 After lunch it was a short 20 minutes walk back over the bridge and through the chaotic, congested new town of Naya Pul where we were picked up by our bus which transported us back to Pokhara. At the hotel we said a final goodbye to our porters, and had a relaxing afternoon beside the lake. 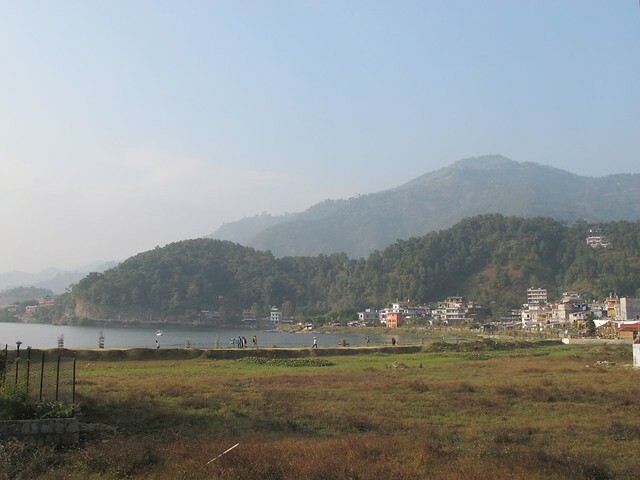 The following day we had more time for sight-seeing in Pokhara beside the Fewa Lake, before our transfer flight back to the bustling city of Kathmandu. 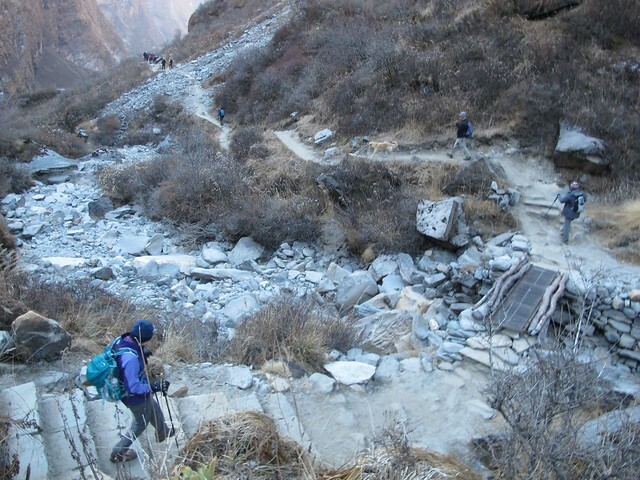 We retraced the trail we had taken five days earlier coming from Chomrong. 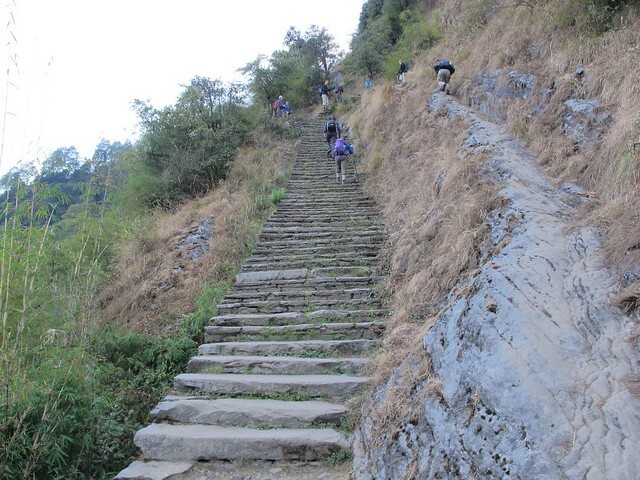 This part of the trek involved numerous sections with steps, which are equally relentless in either direction as there isn’t much difference in elevation between Chomrong and Bamboo. 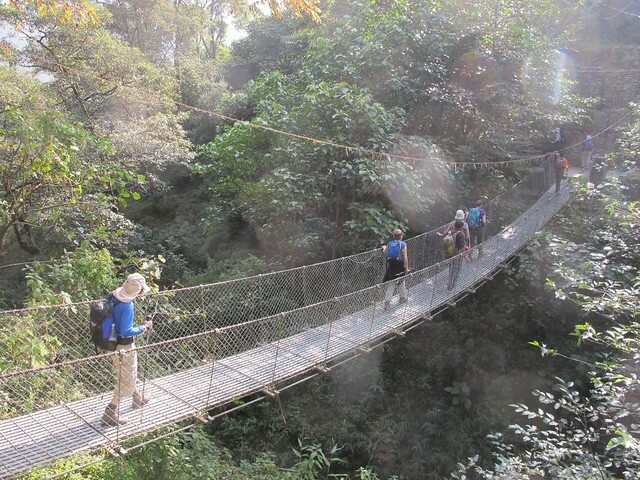 However it was a lovely day and was an interesting walk, passing through both rain forest, then agricultural land with farms, and people at work. 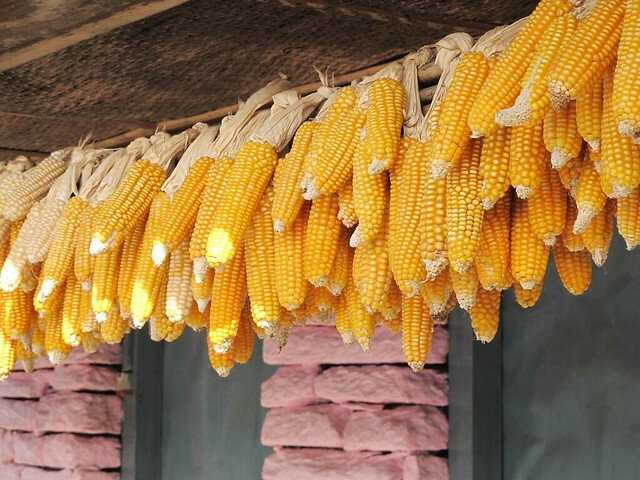 With being autumn we saw crops which had been newly harvested and they were being sorted, dried and getting ready for storage – even if we didn’t always know what the crops were! 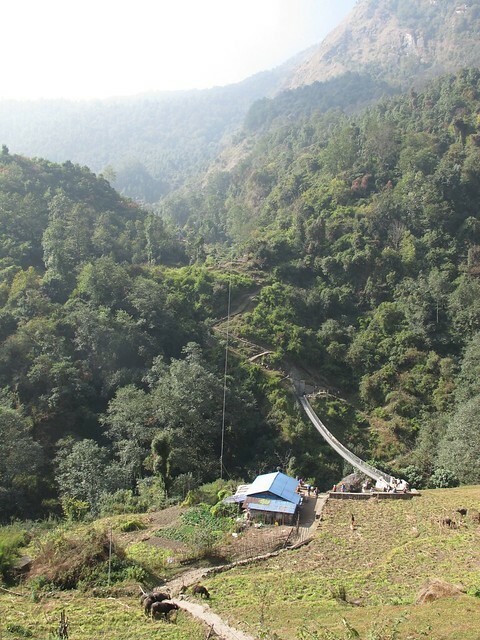 From Sunuwa where we stopped for morning tea, we could see Chromrong straight across the valley, but we had to descend to the suspension bridge over the Chromrong Khola then climb back up several hundred metres. 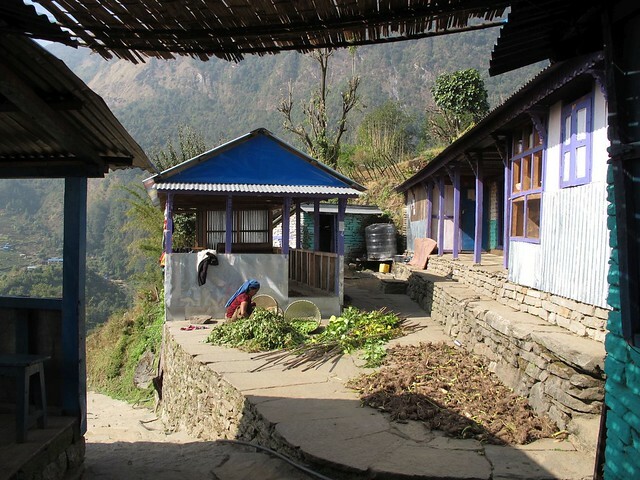 We stopped at the tea house at Chomrong which we had stayed in overnight several days ago. 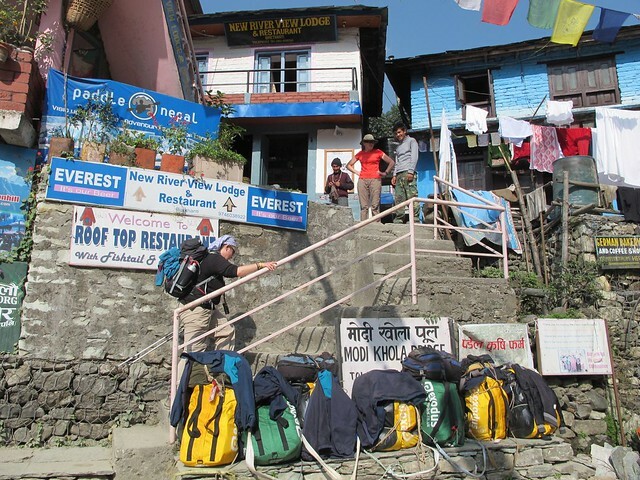 Here we picked up the spare clothing and laundry which many of us had left behind to lighten the load for our porters. 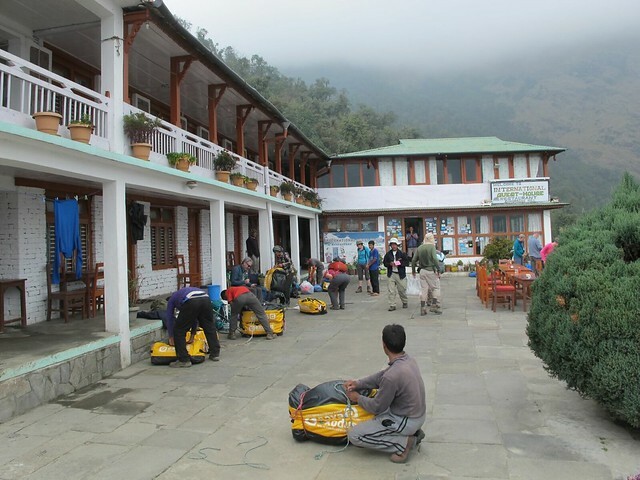 The porters had waited for us here and we repacked out kit bags. 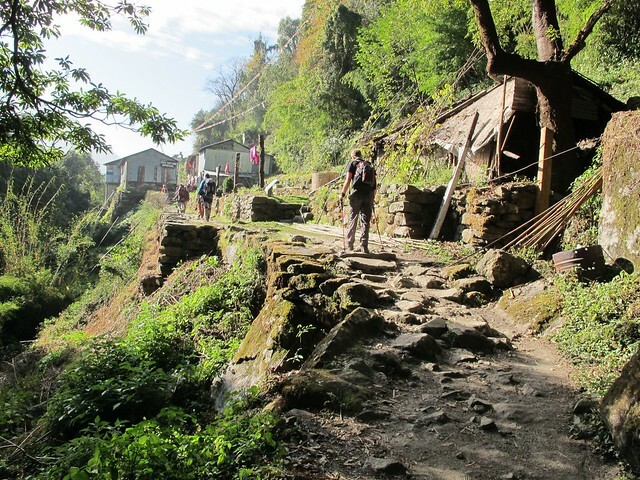 From Chomrong it was a steep descent down to the Mhodi Khola valley and to our tea house at Jhinu Danda. 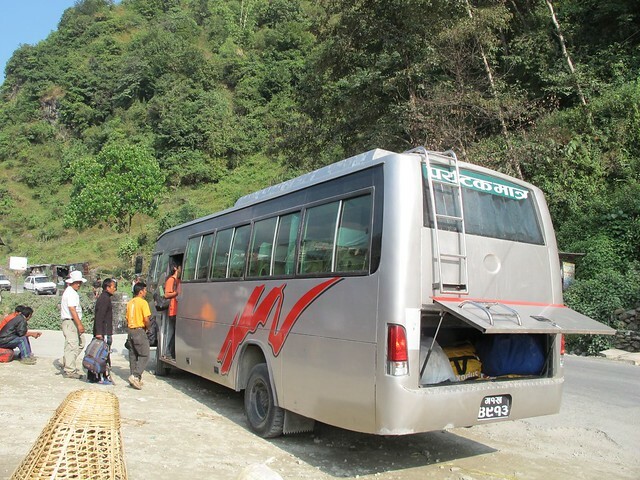 My first impression of the Jhinu Danda was it was bright, brash and busy. So different to the bleak, but majestic, isolation of two days before at ABC. 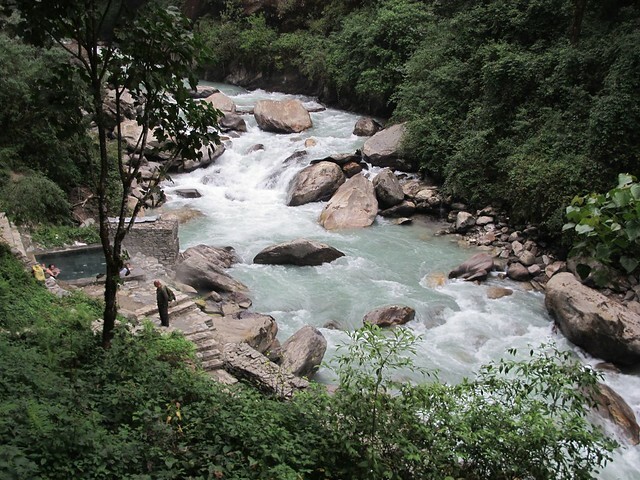 Jhnu Danda, for all its business, had one very big positive – the local natural hot springs! 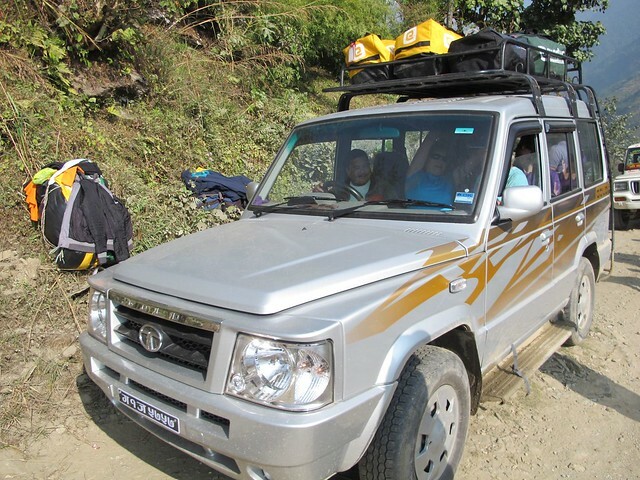 As soon as we’d sorted our rooms, six of our group grabbed our bathing suits, towels and soap, etc and headed down to the springs. The springs were about 20 minutes walk down from the village and were wonderful. 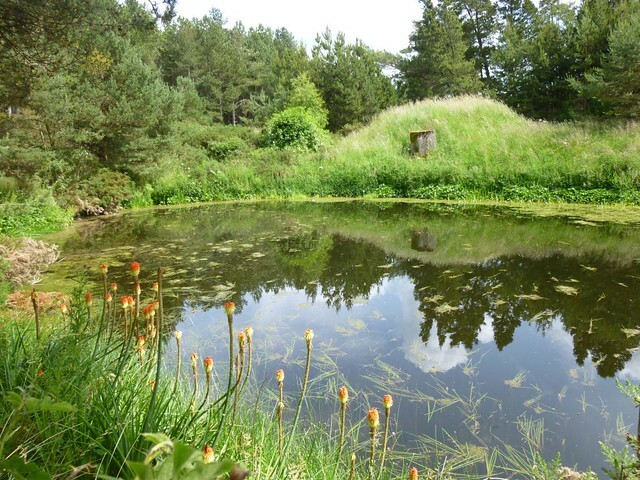 The ‘changing rooms’ were a very basic metal hut, while the spring water was diverted into three small pools built from stone slabs and concrete. Basic, but wonderful! 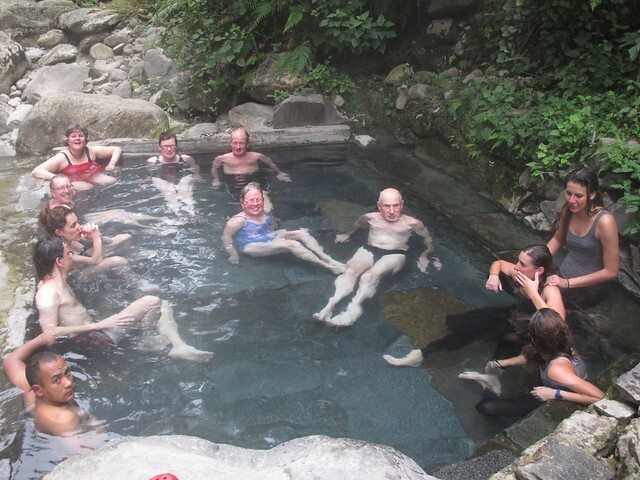 The water was hot and we were delighted at being able to bathe in an unending supply of hot water. 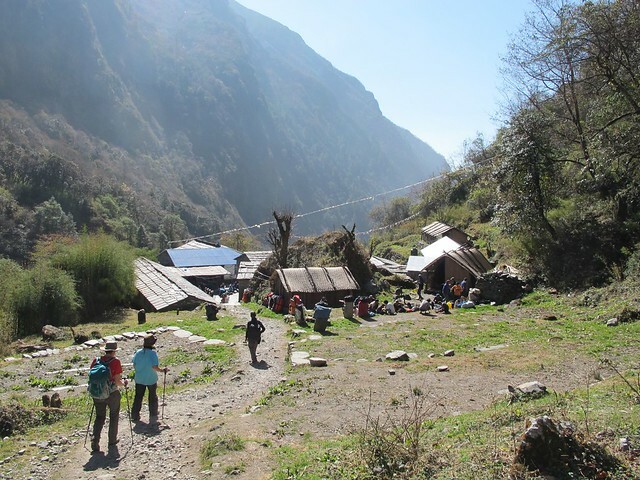 Our guides and porters also made use of the facilities. 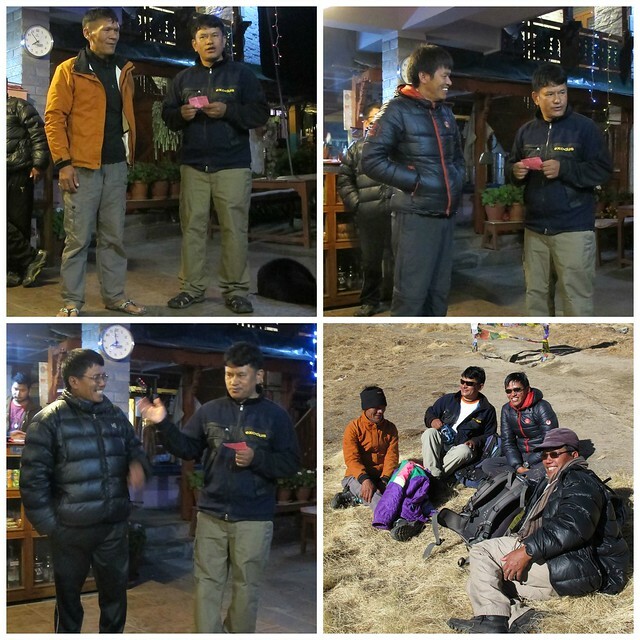 After our meal, our leader Keshar invited the porters to join us and we thanked then all (and gave them tips) for their hard work for the past two weeks. 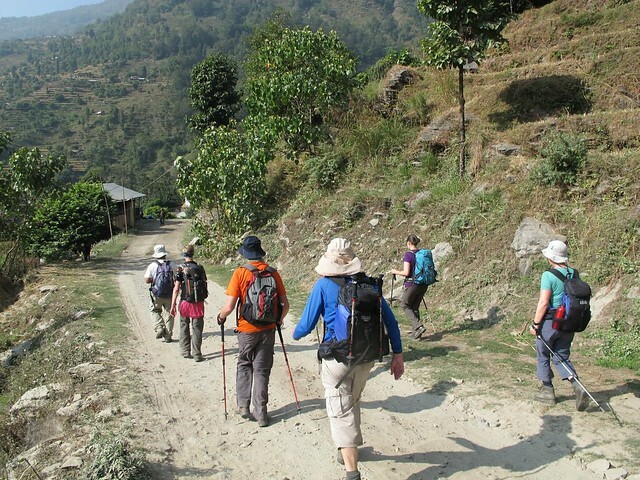 Also our three assistants, who had done a brilliant job at keeping the group together, while making sure we all were able to walk at a pace that felt comfortable to each of us. This was followed by general merriment as Keshar produced one of the local drums. 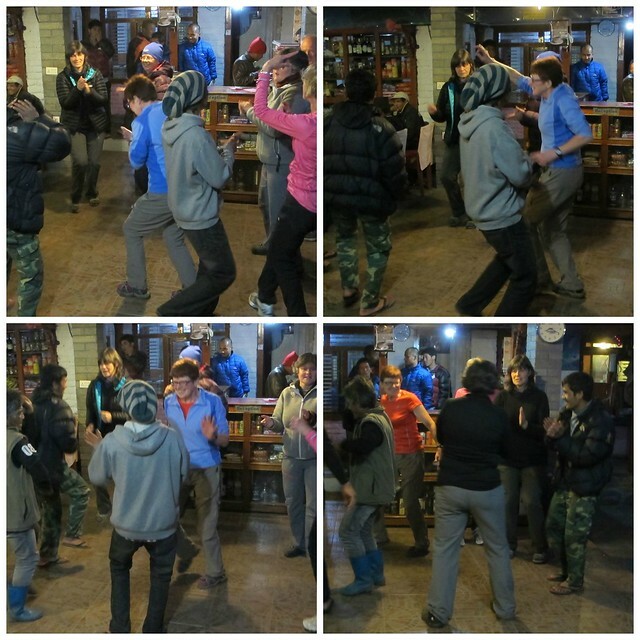 One of the porters played while several of us trekkers and porters gave it a whirl on the dance floor! 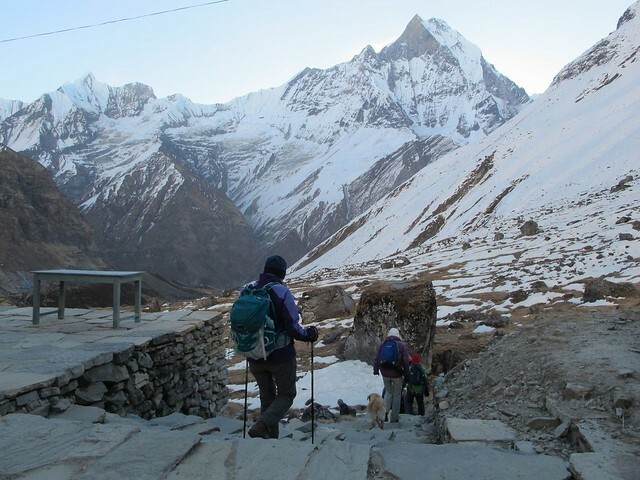 We rose early to see the early light illuminate the big mountains in the sanctuary. I spent some time before breakfast gazing at these thinking about the mountaineers who had attempted to climb them over the years. 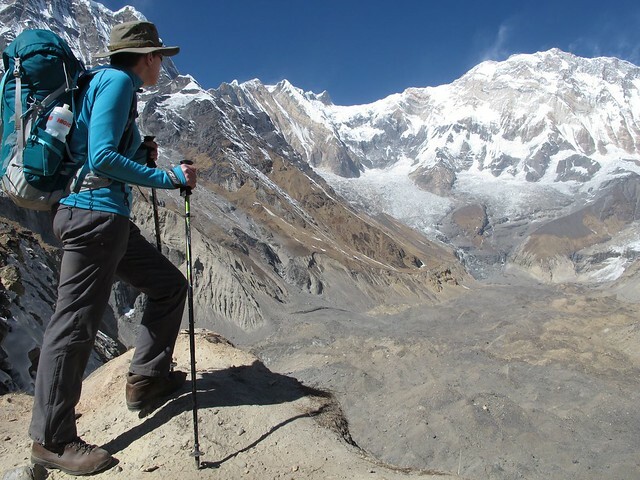 Annapurna 1 at 8091m (26,545 ft) is the 10th-tallest mountain in the world, but its summit success rate is much lower than that of Everest, and sadly the death rate is higher. 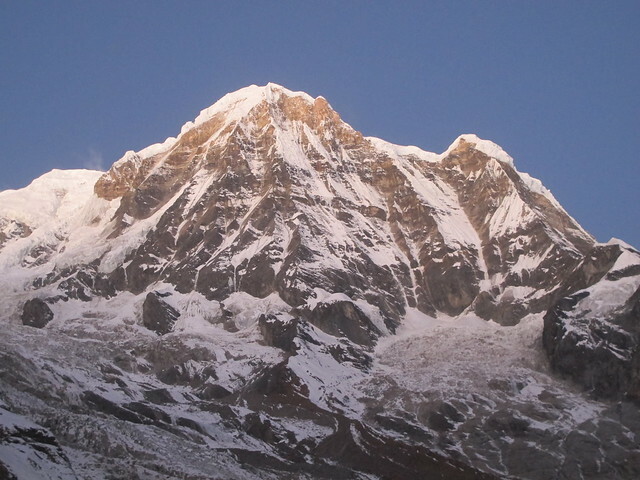 Annapurna I was first summitted by a French expedition led by Maurice Herzog and Louis Lachenal on 3 June 1950. 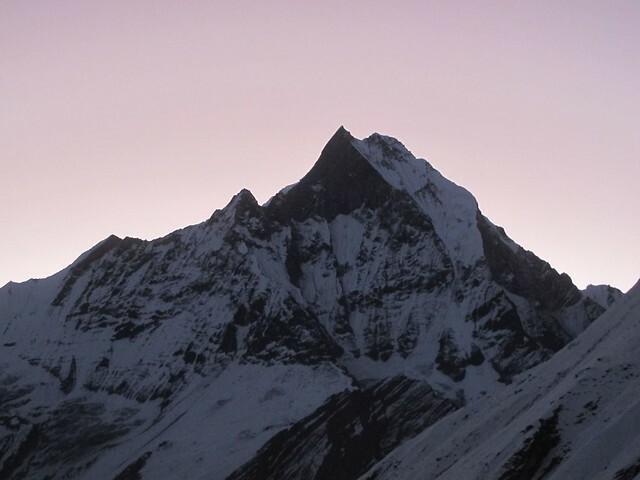 In 1970 the south face of Annapurna I was conquered by Don Whillans and Dougal Haston, members of a British expedition led by Chris Bonington which included the alpinist Ian Clough who was killed by a falling sérac (ice-pillar) on the mountain’s lower slopes. Again we were so fortunate the sky was clear, even if this meant it was a cold start again. 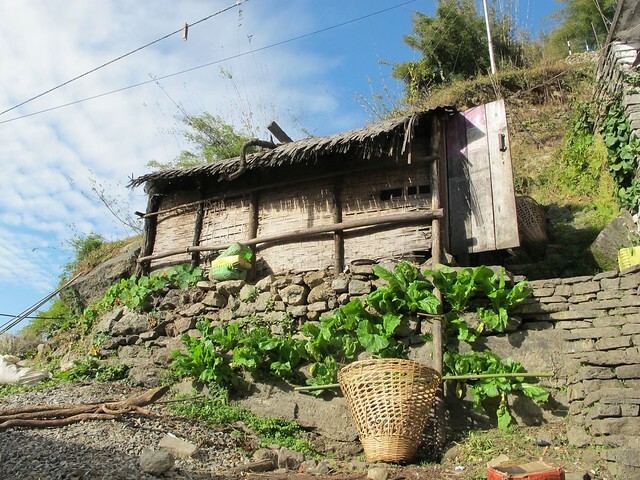 As we stepped outside we discovered one of the mountain dogs, which seem to wander from village to village or tea houses, had been sleeping outside. 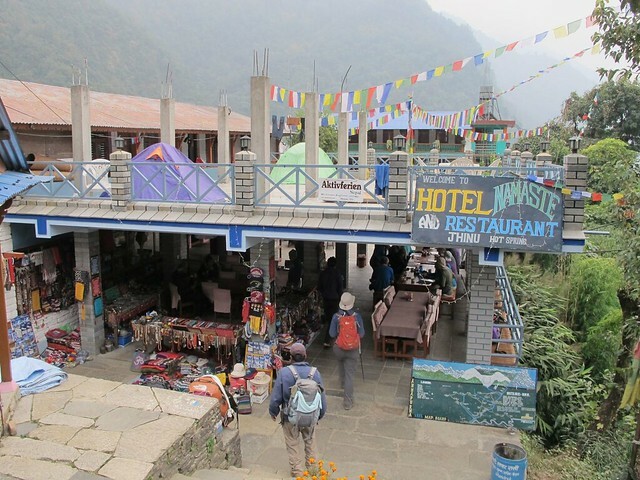 We had a long walk today to get down to Bamboo, passing through MBC and other lodges we’d stopped at for tea, lunch or overnight on our ascent. 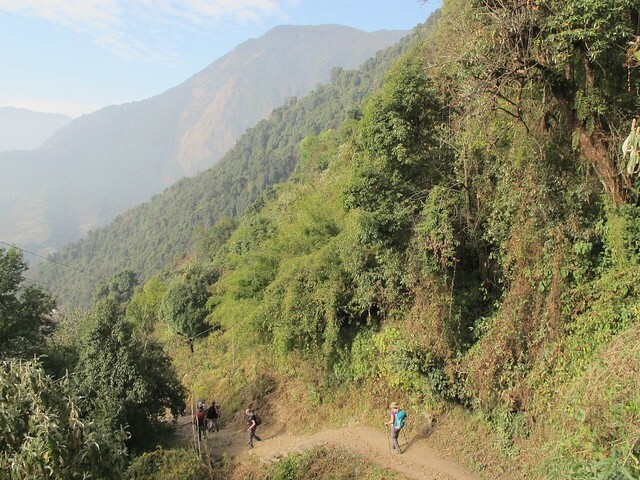 Of course, being the Himalayas, it was not simply downhill, but there was some ascent throughout the course of the day. 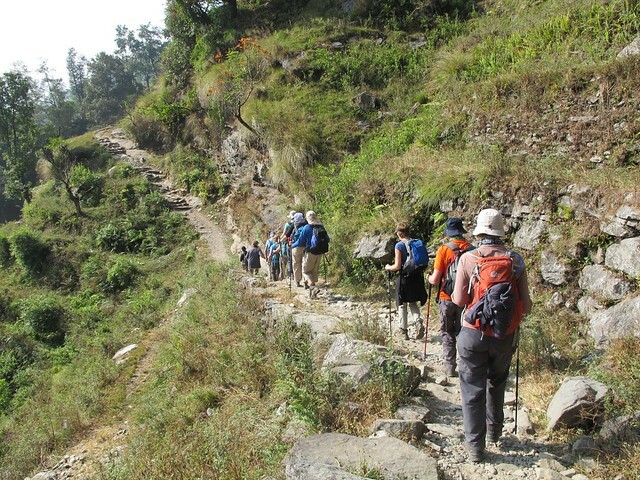 We passed many trekkers heading up, including some we recognised from other places on the trail. 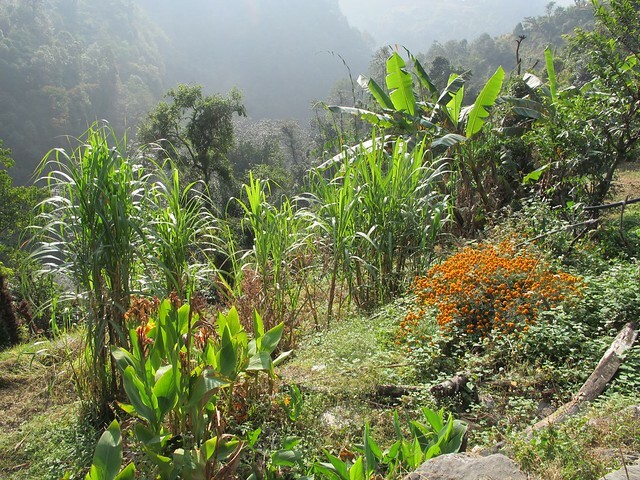 By the time we reached our morning tea stop the sun had come over the ridge and was warming us down in the ravine. 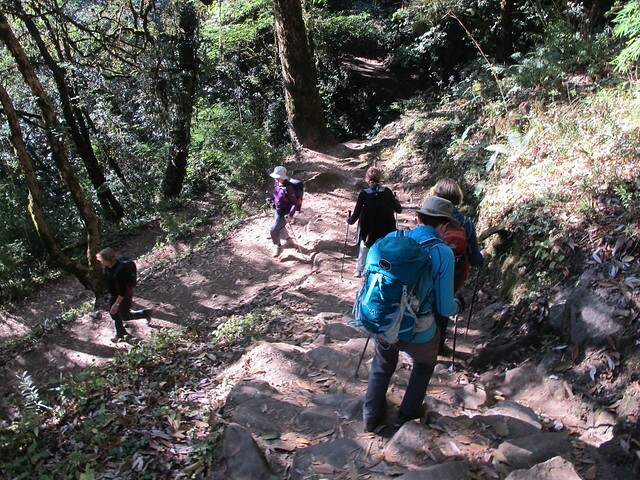 After a couple of hours walking, we left the rocky landscape behind as we entered the cloud forest again. 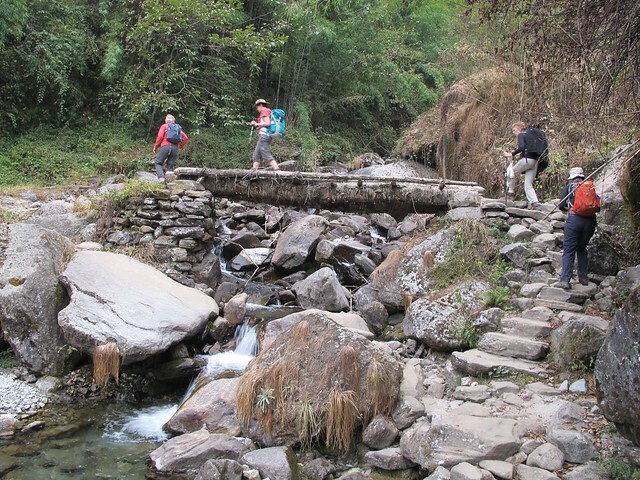 Here there were many small stream crossings and often a precipitous drop to the side of the path. I didn’t enjoy the walk today as, unfortunately, I was light-headed and feeling like I was going to faint! 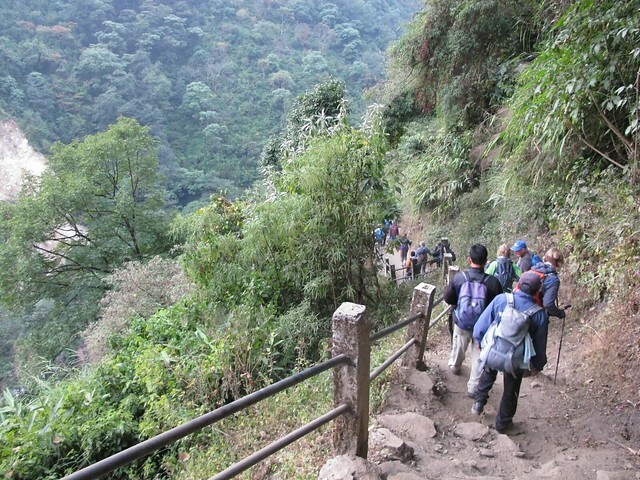 Not good when walking on a narrow path with a drop down to the ravine! This was caused by dehydration and it was my own fault. I realise the mistake I made was not drinking sufficient water the previous day. When I should have drunk extra water to combat the effects of altitude, I had in fact drunk less. With spending the afternoon sitting around at ABC, I had not been continually sipping water, like I had the previous days when walking. Then when I tried to take several good slugs of water in the morning, the water in my Camelbak was so cold it gave me a headache. The light-headedness came on very suddenly and although I took some rehydration powder and lots of water, it took more than 24 hours to recover from this. 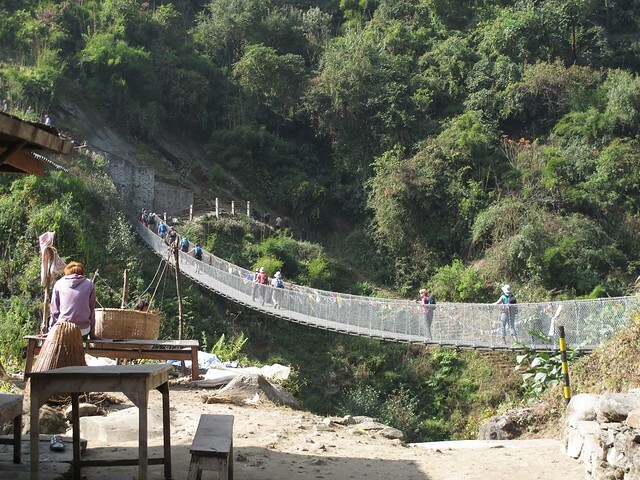 I was very relieved when we eventually reached our tea house at Bamboo that afternoon. The temperature soon dropped when the cloud rolled in. 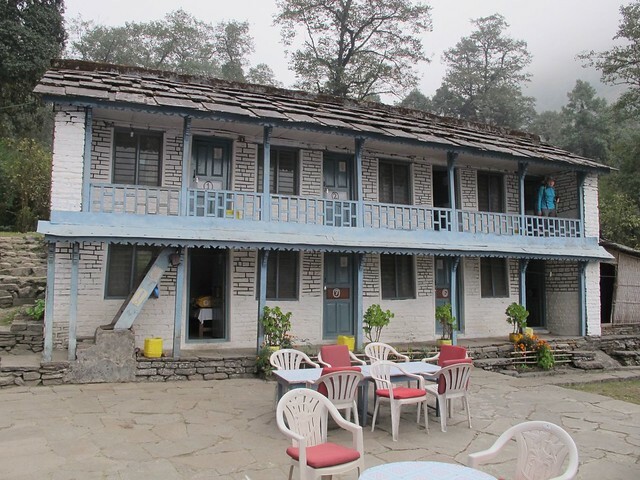 We were delighted to find this tea house had a gas shower, and despite the unheated (ie freezing cold) shower room, it was brilliant to shower after going several days without a shower! 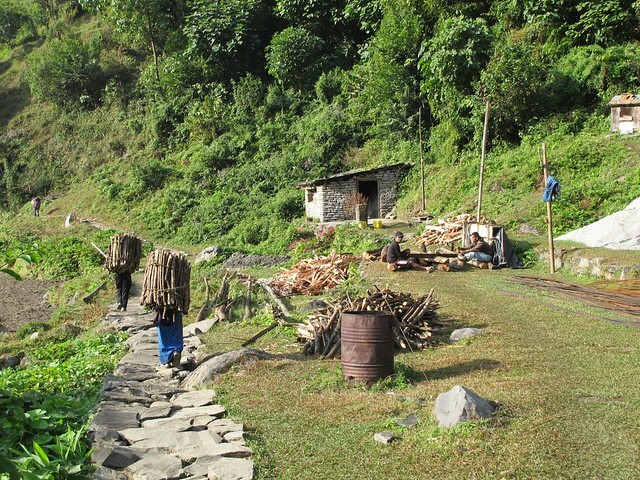 As the tea house at Bamboo is still within the conservation area, they cannot burn firewood, so they did not have an oil-drum stove as we had experienced as some other tea houses. 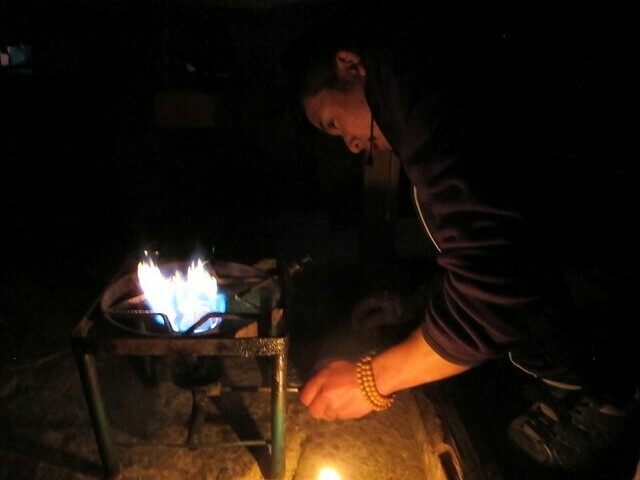 To keep warm in the cold evening, we paid for the owner to light the ‘under-table’ stove as we had at MBC and ABC. This is simply a gas burner that is placed under the table (which I presume is covered underneath by metal) and the table has a thick blanket ‘skirt’. You sit with the blanket on your lap and get warm knees and cool toes and a cold back. My blog is mainly about hillwalking, but also about nature, books, outdoors news items, food and anything else that moves me to write. Please note that any ads you see on this blog are placed here by WordPress.com. 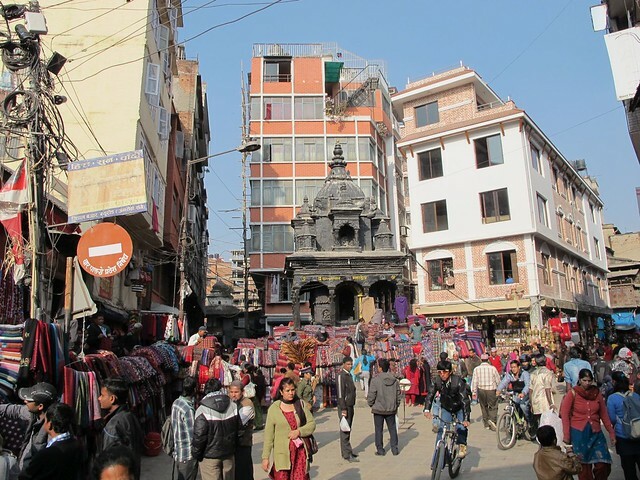 The Administrators of this blog have no connection to, or financial interest in, any of the promoted products and gain no income from any advertising displayed on this blog.